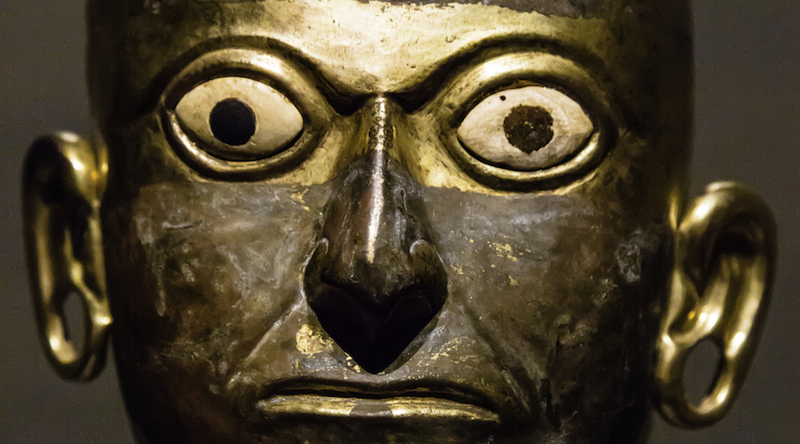 Peruvian copper burial mask. Photo by Thad Zajdowicz, Flickr. Copper bears could get caught wrong-footed as a strike looms at the world’s biggest mine. In the U.S., hedge funds’ bearish bets outnumber bullish wagers by the most since 2016, latest government data show. The top brokers on the Shanghai Futures Exchange boosted their net-short position by more than half. Sentiment has turned increasingly negative even as BHP Billiton Ltd. and workers at its Escondida mine in Chile approach the end of a government-led mediation, after wage talks failed. A strike could start as early as Tuesday. Copper has slumped almost 17 percent this year on Comex as an escalating trade war between the U.S. and China threatens global growth, fueling demand concerns for the metal that goes into building power grids, homes, cars and electronic gadgets. Societe Generale SA analyst Robin Bhar said the market is “fixated” on concerns about the global economy, ignoring the bullish factors that could send prices higher, including potential strikes in Chile. Copper, often seen as a barometer of economic growth, posted the eighth weekly loss in the past nine. Futures for September delivery slipped 0.8 percent to settle at $2.7425 a pound Friday on the Comex in New York. Money managers’ net-short position, or the difference between bets on price declines and wagers on price gains, reached 29,986 futures and options as of Aug. 7, according to Commodity Futures Trading Commission data released Friday. Bearish wagers are near the highest on records going back to 2006, data showed. Things could turn quickly, should mediation fail and work stops at Escondida, squeezing bearish money managers and brokers in China and the U.S.
Labor tensions in Chile aren’t restricted to the BHP-owned behemoth. Pan Pacific Copper Co.’s Caserones mine is following a similar path, with workers voting to strike if mediation fails. The giant Chuquicamata open pit has been hit by protests as workers fret about a transition to underground operations that require a smaller workforce. There’s less cushion to protect users of the metal against supply shocks, with stockpiles tracked by the London Metal Exchange down more than a third since the end of March, while those in warehouses monitored by Comex are at the lowest in 10 months. Inventories tallied by the Shanghai Futures Exchange are at the lowest since January. Investors who have focused on the U.S.- China trade war have one other thing to consider: Beijing’s decision to slap a 25 percent tariff on American scrap would make refined copper more attractive than the recycled material, boosting the Asian nation’s imports of new metal, according to SMM Information & Technology Co. The U.S. supplied about 535,000 metric tons of copper scrap to China last year, about 15 percent of the nation’s overseas purchases. That could further bolster demand at a time when the Chilean mining industry is seeing a record number of collective bargaining negotiations, that have the potential to disrupt operations. 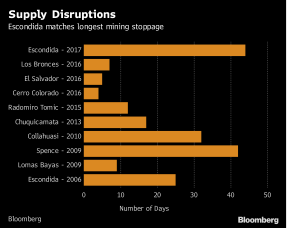 Last year, when BHP and the union failed to reach an agreement, a 44-day strike at the world’s largest copper mine and a slower ramp-up at Escondida’s third mill cut output by 300,000 tons, Goldman Sachs Group Inc. analysts estimate. Mediation at Escondida ends Monday, and without an extension or an agreement, the strike could start Tuesday. The two parties’ positions seem far apart after more than two months of discussions, with 84 percent of workers rejecting the company’s last offer. The union is already geared up for a work stoppage, having stashed away about $864,000 to cover costs during a possible monthlong strike. Talks were continuing over the weekend, the union said. “Positive fundamentals take a backseat,” Societe Generale’s Bhar said in a note Thursday. “Macro woes, which could be indicating sluggish demand and a potential economic slowdown are overshadowing short-term bullish factors, ” including the potential strikes in Chile and declining inventories, he said. (By Susanne Barton and Laura Millan Lombrana).